Harry Ghaul, co-captain and fullback, starts his second year with the Hurricanes as one of the most acclaimed players the Hurricanes as one of the most acclaimed players the Hurricanes have ever had. Last year as a freshman his 11 games punt averages of 40.6 for 73 kicks was second in the nation. His 101 point scoring record set a Miami record and was fifth in the U.S. His record of 23 extra points kicked in 28 tries was the highest percentage of conversions among those with 15 or more tries. 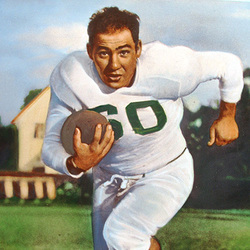 His rushing record of 457 yards net in 132 plays was the highest on the team and second only to Howard Plasman's 489 yards in 91 tries in 1941 for toal yardage gained the first year. Ghaul also led the team in kicking off and returning kickoffs, his 82 yard intercepted pass run against Auburn was the longest run of the regular campaign and he completed 11 of 30 forward passes he tried, to top the team. Ghaul, with one year of experience behind him, more help from the other fullbacks and a bigger and better line in front of him should have quite a year.